***NOTICE: The new year's annual range safety brief, recreation permits, and downrange wood collecting permits are now available for the 2019-2020 year. One day fishing permits are available after taking the new year's range safety brief. The new year's permits will not be valid or able to be used until 1 April 2019. The previous year's permits (for 2018-2019 year) are no longer available. ***Fort Carson has begun fish stocking at the reservoirs for the summer. ***Information on prairie dog recreational shooting can be found on "Hunting" and "Open Areas" pages or by clicking HERE. e. Customers obtaining a pass online must print a copy of the pass. If unable to print a downrange pass when checking-in (e.g., using a mobile device), the customer must provide a legible hand-written paper pass. f. Hand-written paper passes must include the customer’s name, permit number, the date, and training area or block the customer is checked into. A hand-written downrange pass can only be used after the customer has successfully completed the check in procedure on the iSportsman website and does not have access to a printer. ***If you harvested a big game this hunting season and were not able to record the harvest, please call 719-526-8006 to provide the information. Thank you for your assistance! ***All recreationists, including fishermen, must complete the annual range safety brief before any permits will show or be available. 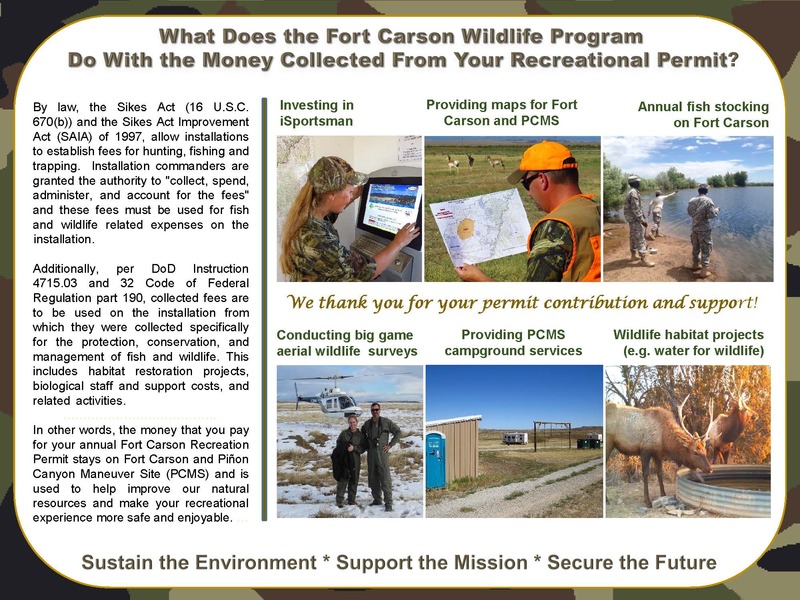 ​***Fort Carson's 200-6 Regulation, Wildlife Management and Recreation, has been revised (dated 17 May 2018). It is HIGHLY advised that everyone recreating on Fort Carson (FC) read this regulation in its entirety. Also a Supplemental Information Document was created to hopefully assist with understanding rules and steps to recreate on FC. Also, posted on this document are newly Reduced Recreation Permit prices for some customers and information concerning printing permits/passes, youth and non-participants. ​If it is your first time on iSportsman (for recreation and/or firewood collection) OR if it is your first time on FC iSportsman since August 28, 2017: Customers must first Register and create an account. Go to "Register" from the "Account Register & Log In Site" drop down. Enter information and remember your login ID (user name) and password to log in to the site after registration is complete. 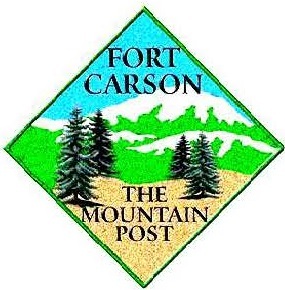 However, if you have previously registered on iSportsman at another installation or facility across the U.S. - You do not need to register on the Fort Carson iSportsman. Instead, select "Login" and use the username and password that you created at the other installation's iSportsman. Select YES, when asked if you want to join the Fort Carson iSportsman Portal. Hence forth, after registering, you will log into your account by selecting "Login". ​There is a new procedure to acquire a firewood collection permit and downrange pass for Downrange Wood Collection. All wood collection permits (i.e., wood yard or downrange wood collection) and the wood splitter rental are bought here on Fort Carson's iSportsman website. Permits cannot be purchased in-person anymore. Go to "Firewood Collection Program" above for all the details and instructions on how to buy your firewood permits. *** For information on PCMS *** (e.g.. closures, safety briefs, & other information specific to PCMS) visit the PCMS Info page above. Attention hunters - Fort Carson is not a Trophy Buck management area. Our deer population has been drastically reduced via over harvest to research several methods to control chronic wasting disease (CWD). All persons getting a downrange pass should be familiar with map reading and land navigation prior to accessing downrange areas. DO NOT ENTER training areas that are not part of the Block on your Downrange Pass. You must check out at the kiosk when leaving Fort Carson or PCMS. If you cannot checkout, then turn in your pass at Range Control. Additionally, if you have problems checking in or out with iSportsman, please go to Range Control to do manual check-in/ out. The PCMS gate is located at mile marker 24, about 35 miles northeast of Trinidad and 50 miles southeast of La Junta on US Highway 350. The installation is 35 miles from the nearest store or gas, so plan accordingly. For more information on hunting at PCMS please visit the PCMS page.